Ford India’s combined domestic wholesales and export sales in February grew to 17,306 vehicles up from 12,576 vehicles in the corresponding month last year. February domestic wholesales were at 5,483 vehicles against 5,959 units in the same month last year, while exports grew to 11,823 vehicles compared to 6,617 units in February 2015. Toyota Kirloskar Motor sold a total of 11,215 units in the month of February 2016. TKM sold 10,312 units in the domestic market & exported 903 units of the Etios series clocking a total of 11,215 units in February 2016. The company sold a total of 11, 802 units in the domestic market in February 2015 and exported 1,475 units of the Etios series in the same month. India Yamaha Motor Pvt. Ltd. revealed a growth rate of 50% in domestic sales in February 2016, as compared to the corresponding period last year. The company sold 56,960 units in February 2016 as against 37,982 units sold in February last year in the domestic market. Part of the USD 16.9 billion Mahindra Group, Mahindra Two Wheelers announced its sales numbers, which stood at 9,952 units for February 2016. 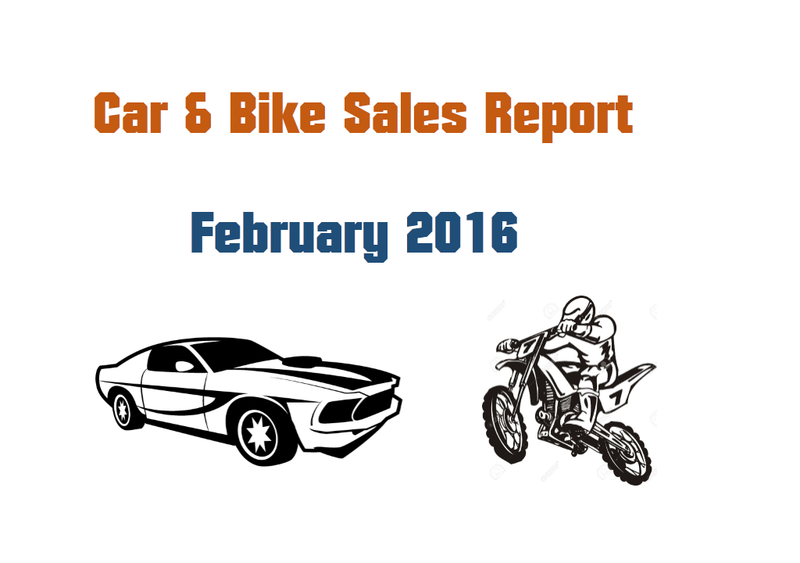 The company’s domestic sales during February 2016 stood at ,8643 units. Exports for the month stood at 1,309 ­­­­units. Mahindra & Mahindra Ltd, India’s leading SUV manufacturer, announced its auto sales numbers which stood at 44,002 units during February 2016 as against 38,030 units during February 2015, representing a growth of 16%. The Passenger Vehicles segment (which includes UVs, Cars and Vans) sold 23,718 units in February 2016 as against 18,817 units during February 2015, a growth of 26%. The company’s domestic sales stood at 41,348 units during February 2016 as against 34,918 units during February 2015. In February 2016, the Medium and Heavy Commercial Vehicles segment sold 479 units, registering a growth of 47%. Exports for February 2016 stood at 2,654 units. Royal Enfield continues 2016 with a strong sales performance and posted sales of sales of 49,156 units in combined domestic wholesale and exports in February 2016 recording a growth of 63 % over same period last year. Renault India registered a massive growth of 158% with monthly domestic sales of 8,834 units in February 2016 as against 3,419 units in the corresponding month last year. Renault KWID continues to play a pivotal role in Renault’s expansion plans in India with customer orders crossing the 100,000 mark. Hyundai Motor India Ltd, the country’s leading car manufacturer and the largest passenger car exporter registered the domestic sales of 40,716 units in February 2016. Hyundai's domestic sales grew by 9.1% on the strength of strong performance of the three ‘Indian Car Of The Year’ brands Creta, Elite i20 and Grand i10.